I had an email recently from a British friend (at least I hope we are still friends) blasting me for advising the coalition government and for my foolishness at not seeing that David Cameron is Margaret Thatcher all over again. 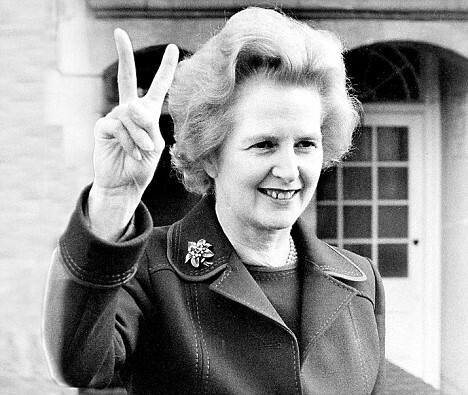 A mutual friend (who I know is still a friend) said “Don’t take it personally, we hate Tories and we always will.” Both of them are in their 60s, and there are many other people in their generation who will never, in particular, stop loathing Margaret Thatcher. When the current crop of Tory leaders does something different than Margaret Thatcher they see it as a trick to convince the public that the party has changed. When the current crop of Tory leaders does something reminiscent of Maragaret Thatcher, they see it as proof that soon, David Cameron will rip of his face Mission-Impossible style and reveal the grinning, gap-toothed visage they knew was concealed there all along. Thatcher makes an intriguing foil to her contemporary conservative head of state, President Reagan. When the latter was revealed to have Alzheimer’s disease, many people who voted against him voiced sincere sympathy for what he and his family were going through. In contrast, I spend an awful lot of of time in the U.K. and am in touch with people there almost every day, and I have to say that if Ms. Thatcher’s own dementia is generating sympathy in Brits who hated her policies, they are doing a frightfully good job of hiding it. I don’t even hear much sympathy from people who did vote for her. Thatcher seems to be in that small group of politicians who have a strange political legacy: The number of people who today acknowledge voting for them is far fewer than could explain all the elections they won. While over there they are actually learning to stand up like humans and are leaving the snorting to pigs. All the thinking tories left the US by 1783. That was a joke. Well, it was meant to be. I think there was a difference between how Reagan and Thatcher were seen personally. Reagan really was the “great communciator” but I don’t think people believed that he believed in what he said. Cigarette commercials and the “evil empire” were at an equal level. Someone else wrote the script and most people accepted that. I think most people held that Thatcher meant what she said and believed and tried to put into practice with she said. For their opponents, Reagen was the face of the enemy while Thatcher was (or was the embodiment) of the enemy. In Berlin Reagan could say “Mr.Gorbachev, tear down this wall.” It was rhetorical. Maggie would have rolled up her sleeves and swung the hammer. And she did. Just not at that wall. This reminds me of the time, back in 1990, when this guy in Arizona spent about an hour trying to convince me that giving up control over Eastern Europe was just a ploy by the Soviets to lure us into complacency, after which they’d have us exactly where they wanted us. There is an element of sheer silliness to this posting. In the first place, when Maggie came into office she found income tax at a top rate of 83%! You can make a much better argument tat 83% is a punitive rate that is harming the economy, than that the current top rate is. In the second place, Thatcher didn’t reduce income taxes right away. In fact, when she had been in office for nine of her eleven years, the top rate was still 60%. Finally, imagining that reducing taxes is an unambiguous good is naive thinking. It depends on context. Reducing taxes when you have already done a good deal of reform of the economy and reduced deficits is one thing, but reducing taxes when you have inherited a massive deficit from your incompetent predecessors *without* reforming the economy first, looks like recklessness. Hilzoy reminds me of one the cognitive dissonance studies in the 1950s or 1960s (by Leon Festinger I think) of a doomsday cult. They all got together and prayed because the world was going to end at some particular point. When it didn’t end, rather than realize their own foolishness and disband, they decided that the reason the world didn’t end was because of their intense faith in the first place, so the cult had to be maintained to avoid catastrophe. Thatcher raised VAT. I must say that the Tories and LibDems described in that first paragraph sound quite nice. Parallel reality perhaps? Thatcher was a confrontational figure. Even when she was being cautious, popular and political, she managed to make it sound confrontational. And she left, evicted by her own party (rather as if Edward Kennedy had defeated Carter at the Convention, or Ronald Reagan President Ford in 1976), over the incredibly contentious poll tax riots. We have not, until now over the education riots had widespread confrontations like that on British streets. In 1981 we had the firebomb battles in Brixton, Toxteth etc (black v. white police, but many of the youth involved were in fact police). Not to mention the Miners Strike and pitched battles at the coalfields. There were no ‘American riots’ against Ronald Reagan. Generally he is remembered as a genial figure who laid the foundation for the end of the Cold War, and who left at a time of rising prosperity. After Mrs. T we had a brutal recession and a divisive legacy– her party was politically crippled for 15 years. But lots of people do think she was the best PM we had since Winston Churchill. On the Guardian polls, travel carefully. The Guardian polls almost always shoot low on the tory popularity and vote share by 2-5%. It is the liberal newspaper after all. Valuethinker: Caution noted on Guardian polls — thanks. The virtue of them is that they have a very long historical series on their website, so if you assume that the bias you note is roughly constant over time, the series still gives meaningful insights into trends. Seems to me that a lot of the difference might be that Reagan had a longterm concerted effort (like Nixon) to burnish his post-office public image, whereas Thatcher really didn’t. Which may say not so much about the town politicians as about the US and british systems of government. Presidents are heads of state rather than (or at most in addition to) leaders of party, so their power base is different. And presidents are term-limited, whereas prime ministers stay on until ousted, with a chance of coming back. So No one in their own party is interested in retrospective apple-polishing. Previous Previous post: How do you say “The times they are a-changing” in Erse?